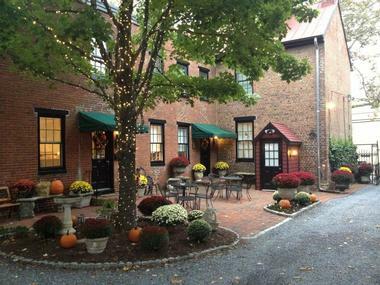 Situated on the prestigious Prince George Street in the heart of the Historic District of Annapolis, Gibson’s Lodgings Inn is a beautifully maintained inn that offers luxurious accommodations set around a lovely central courtyard, modern conference facilities and good, old-fashioned hospitality. Located just steps away from City Dock and the US Naval Academy, the 18th Century Georgian-style home was lovingly restored to its former glory after the original structure, which was built in 1681 and known as ‘the Old Courthouse,' burned to the ground. The existing building’s façade, now known as the ‘Patterson House,' is an outstanding example of the Victorian influence on Annapolis architecture. The well-appointed Georgian-era townhouse hotel features 20 luxurious guest suites with convenient amenities, three glorious 19th-century parlors, a comfortable and inviting dining room and modern conference facilities for business meetings and other social events. A beautiful central courtyard is an ideal place to relax with a book or enjoy the hearty complimentary breakfast served each morning. 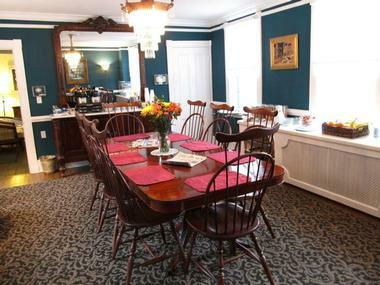 Gibson’s Lodgings Inn is ideally situated for exploring this charming city and is within a short stroll from several of the city’s main attractions, including the State Capital, the City Dock, The US Naval Academy, and the famed St. John’s College. Accommodations at the Gibson’s Lodgings Inn is spread over three houses, namely the Berman, the Lauer, and the Patterson House, each of which features beautifully appointed and individually decorated guest rooms and suites. Complimentary high-speed wireless Internet is available in all the guestrooms and throughout the hotel. 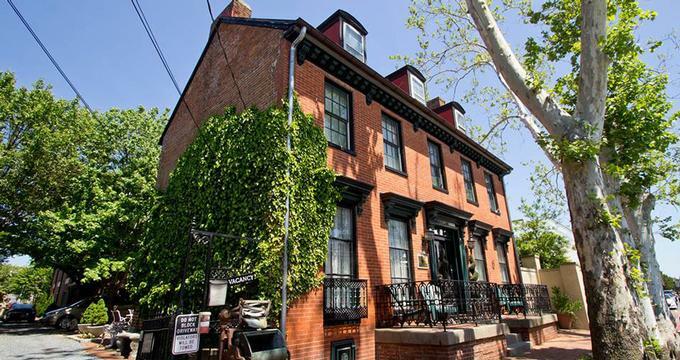 Built in the 1890s, The Berman House features nine guest rooms, three of which are located on the ground floor and three pet-friendly rooms, a cozy parlor and a small, fully equipped kitchen. Eight of the nine guest rooms have queen-size beds and one has twin beds dressed in luxurious linens, and all enjoy private en-suite bathrooms with glass-enclosed showers, single vanities, and deluxe bath products. Guest rooms are sunny and bright and feature modern amenities, including flat-screen televisions with cable channels, direct dial telephones, alarm clocks, hair dryer and air-conditioning. The Inn’s newest building, the Lauer House, was built in 1988 and features the largest guest rooms in the hotel, as well as a comfortable parlor, an elegant dining room, and a fully-equipped kitchen for guests to use. The second and third floor of the Inn house six guest rooms with king-size beds and plush pillow top mattresses dressed with fine linens, private en-suite bathrooms with glass-enclosed showers, single vanities, and deluxe bath products. Spacious sitting areas have two plush recliners and wall-mounted fireplaces, and some rooms offer queen-size sleeper sofas and extra cots for kids. Modern amenities include flat-screen televisions with cable channels, direct dial telephones, alarm clocks, hair dryer and air-conditioning. 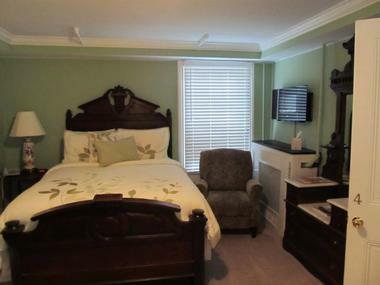 Constructed between 1760 and 1786, the Patterson House features five luxurious guest rooms. Two of the bedrooms have two twin beds with private sinks and a shared bathroom with a shower; one guest room has a queen-size bed and a private en-suite bathroom with a Jacuzzi tub, single vanity, and deluxe bath products, and one bedroom features one king-size bed and a private en-suite bathroom with a shower, single vanity and luxurious bath products. The final suite is the largest of the five and offers two king-size beds, an extra queen-size sleeper sofa for additional guests and a private en-suite bathroom with a shower, single vanity and deluxe bath products. Modern amenities include flat-screen televisions with cable channels, direct dial telephones, alarm clocks, hair dryer and air-conditioning. Guests are treated to a delicious complimentary gourmet breakfast served in the charming dining room in the cooler months or the sunny central courtyard in the summer months. Breakfast includes fresh fruit bowls, yogurts, a variety of cereals, hot oatmeal, homemade granola, freshly baked pastries, bagels and various toppings, a self-service waffle bar, freshly made donuts (weekend only) and fruit juices, coffees and teas. Although Gibson’s Lodgings Inn does not serve lunch or dinner, there are a variety of dining options ranging from casual cafés and fine dining restaurants within walking distance of the hotel in the Historic District of Annapolis. Gibson’s Lodgings Inn offers a variety of guest amenities, including luxurious guest rooms with modern amenities, three elegant 19th-century parlors in which to relax and socialize, an inviting dining room, in which a delicious breakfast is served every morning, and modern conference facilities for business meetings and other social events. A sunny central courtyard offers the perfect spot for relaxing with a book or a drink and soaking up the ambiance. Concierge services at Gibson’s include arranging and reserving city tours, lake cruises, and dinner reservations at a variety of restaurants around the city, as well as arranging transportation to and from the airport. Complimentary high-speed wireless Internet is available in all the guestrooms and throughout the hotel. Gibson’s Lodgings Inn offers a variety of packages for special occasions, such as birthdays, anniversaries and corporate retreats. Annapolis and Anne Arundel County both have a long and illustrious American and maritime history, which is reflected in the many attractions and interesting sites to explore in the city and the surrounding area. Also known as the ‘Sailing Capital of the World,' Annapolis has a deep connection with the water, as well as a rich African-American history and culture, both of can be discovered in the many museums, galleries, cultural centers and other attractions around town. 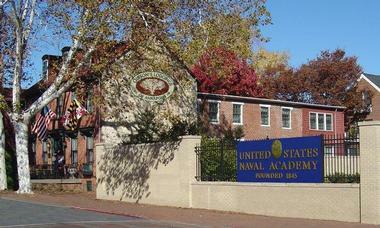 Fascinating history and heritage attractions in and around Annapolis include the Ann Arundel Historical Society, which offers a year-round schedule of programs and activities relating to the county’s history and culture. The Annapolis Maritime Museum offers an in-depth look at the city’s 400 years of maritime history through an array of outstanding exhibits and displays, while the Baltimore & Ohio Railroad Museum is home to 40 acres of railroad history from the Birthplace of American Railroading. Built in circa 1830, the Benson-Hammond House is one of the last surviving farmhouses of the once-booming local farm industry and stands as a period museum which offers an excellent insight into the history of the city. The United States Naval Academy and Armel-Leftwich Visitor Center is the best place to have all your questions about the United States Navy answered and to learn more about the US Navy and US Marine Corps. The Waterfront Warehouse is home to some rare surviving examples of the small warehouses that dotted the Annapolis waterfront in the 18th and early 19th centuries and the Wiley H. Bates Legacy Center and Memorial Courtyard is a unique cultural arts heritage museum displaying historical documents and collections that preserve the Bates Spirit. St. John’s College was founded in 1696 as King William’s School and was the site of Revolutionary and Civil War encampments. Named for Lady Anne Arundell, wife of the founder of the Province of Maryland, Anne Arundel County offers a variety of recreational and leisure activities, including hiking, mountain biking, and picnicking, as well as water-based sports such as sailing and fishing. The County is also home to several state and recreational parks, including Sandy Point State Park on the Broadneck Peninsula near the Chesapeake Bay Bridge, the Patapso Valley State Park situated along the lower Patapsco River, and the Helen Avalynne Tawes Gardens. Other notable parks and green spaces to enjoy include the Baltimore Annapolis Trail, Jug Bay Wetlands Sanctuary, Fort Smallwood Park and Quiet Waters Park. Read more: Weekend Getaways from Washington, DC.